This LibGuide was created to provide resources for students of Islamic Studies. Throughout this guide you will find links to databases, digital collections and recommended books. Similar to JSTOR in that it provides access to journal articles on various topics. This has access to some journals not available through JSTOR. "This authoritative, dynamic resource brings together the best current scholarship in the field for students, scholars, government officials, community groups, and librarians to foster a more accurate and informed understanding of the Islamic world. Oxford Islamic Studies Online features reference content and commentary by renowned scholars in areas such as global Islamic history, concepts, people, practices, politics, and culture, and is regularly updated as new content is commissioned and approved under the guidance of the Editor in Chief, John L. Esposito." Provides annotated bibliographies curated by leading scholars in their fields of over 200 topics concerning Islamic studies. These bibliographies are kept up-to-date and new entries are constantly being added. "ALTAFSIR.COM is a completely free, non-profit website providing access to the largest and greatest online collection of Qur’anic Commentary (tafsir or tafseer), translation, recitation and essential resources in the world." This website provides free online access to Edward William Lane's Arabic-English Lexicon. It allows users to browse through scans of the entire lexicon and also provides easy navigation and zoom functions. MENALIB seeks to provide: Information about ongoing projects, conferences, digital humanities projects in relation to the Middle East and Islamic studies; access to catalogues with rich collections in the fields of Oriental studies; specialised tutorials and assistance for using our rich collections; new Acquisitions in the fields of Islamic and Area Studies as well as MENA Linguistics; access to Open Access Publications; access to MENAdoc Open Access Self-Publishing. "The Quranic Arabic Corpus [is] an annotated linguistic resource which shows the Arabic grammar, syntax and morphology for each word in the Holy Quran. The corpus provides three levels of analysis: morphological annotation, a syntactic treebank and a semantic ontology." Arab Studies Journal is a peer-reviewed, multi-disciplinary research publication in the field of Arab and Middle East Studies. Submissions are evaluated on their scholarly probity not on their theses. 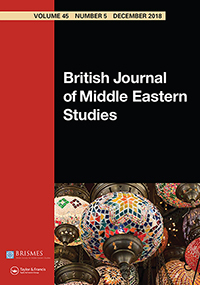 The British Journal of Middle Eastern Studies is a refereed academic journal published for the British Society for Middle Eastern Studies (popularly known as BRISMES). The editors aim to maintain a balance in the Journal's coverage between the modern social sciences and the more traditional disciplines associated with Middle Eastern and Islamic Studies.
" Die Welt des Islams focuses on the history and culture of the people of Islam from the end of the eighteenth century until present times. Special attention is given to literature from this period. Over the last 40 years, Die Welt des Islams has established itself as a journal unrivalled by any other in its field. Its presence in both the major research libraries of the world and in the private libraries of professors, scholars and students shows this journal to be an easy way of staying on top of your discipline. Boasting a large international circulation, Die Welt des Islams takes care to supply its readers with articles in English, French and German. Detailed notes add to already highly descriptive articles. Extensive reviews of relevant books are written by specialists, giving a broader look into the field of Islam." The DTL coverage: 1913-2012 (Bd. 1, Issue 1 - Vol. 52, Issue 3/4) with a 5 year moving wall. "The INTERNATIONAL JOURNAL OF ISLAMIC THOUGHT (IJIT) is an internationally refereed online journal) and printed journal jointly published by the International Society of Muslim Philosophers and Theologians (ISOMPT) and the Department of Theology and Philosophy, National University of Malaysia. The mission of IJIT is to encourage scholarly research in Islamic thought. The Journal provides a unique peer-reviewed forum to postgraduate students, scholars, professors, and researchers in various topics within Islamic thought." "The International Journal of Middle East Studies publishes original research on politics, society and culture in the Middle East from the seventh century to the present day. The journal also covers Spain, south-east Europe, and parts of Africa, South Asia, and the former Soviet Union for subjects of relevance to Middle Eastern civilization. Particular attention is paid to the history, politics, economics, anthropology, sociology, literature, and cultural studies of the area and to comparative religion, theology, law, and philosophy." DTL coverage: 1970-2012 (Vol. 1, No. 1 - Vol. 44, No. 4). For issues from 2012-2016 click HERE. The Islamic Law and Society provides a forum for comparative research in the field of Islamic law in Muslim and non-Muslim countries, covering both theory and practice, from its emergence up to the present. The journal discusses historical, juridical and social-scientific perspectives on Islamic law, including current legal issues and legislation. "Publishes research articles, notes, comments, review-articles and book-reviews in all disciplines of Islamic Studies including the Qur’an, Hadith, Tafsir, Sirah, ‘Ilm al-Kalam, Jurisprudence, Fiqh, Law, Religion, Philosophy, Psychology, Anthropology, Sociology, Culture, Civilization, Economics, Language, Literature, History, Science and Technology. 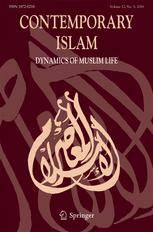 Its contributors include some of the very best scholars from across the world." DTL coverage: 1962-2013 (Vol. 1, No. 1 - Vol. 52, No. 3/4) with a 2 year moving wall. "The Journal of Arabic and Islamic Studies (JAIS) is an international, peer-reviewed, open access, academic journal. It is also the world's most widely read journal in the field of Arabic, Islamic and Middle Eastern Studies. The main aim of the journal is to promote the study of history, language, literature and culture through the publication of research articles." 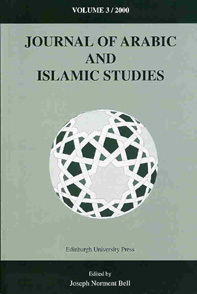 The focus of Journal of Islamic Ethics is on the ethical approaches embedded in Islamic philosophy, theology, mysticism and jurisprudence as well as Islamic civilization in general, and, more particularly, on the principles and methods (to be) followed in applying these approaches to various sectors of contemporary social life. These fields include: Arts, Environment, Economics, Education, Gender, Media, Medicine, Migration & Human Rights, Politics and Psychology. The Journal will strongly focus on thematic issues on current events as well as on individual empirical case studies. The Journal of the Economic and Social History of the Orient contains studies furthering our knowledge of the economic and social history of the Ancient Near East, the World of Islam, and South, Southeast, and East Asia by economic and social historians, historians of law and administration, philologists, ethnographers, anthropologists, archaeologists, theoretical sociologists, and other social scientists. "Since its founding in 1994, the Middle East Quarterly has become America's most authoritative journal of Middle Eastern affairs. Policymakers, opinion-makers, academics, and journalists turn first to the Quarterly, for in-depth analysis of the rapidly-changing landscape of the world's most volatile region. The Quarterly publishes groundbreaking studies, exclusive interviews, insightful commentary, and hard-hitting reviews that tackle the entire range of contemporary concerns — from politics to economics to culture, across a region that stretches from Morocco to Afghanistan." The Middle East Law and Governance (MELG) is a peer-reviewed venue for scholarly analysis on issues of governance and social change in the Middle East and North Africa region. Filling a gap in the academic literature, MELG tackles with breadth and depth compelling governance issues generally, and in the Middle East specifically. The journal welcomes research that explores law, society, and/or governance topics, broadly construed. The MELG’s interdisciplinary approach is meant to attract scholars from a wide range of disciplines (anthropology, economics, history, political science, religious studies, and so on). Though a journal with a regional focus, MELG provides a forum for those interested in governance as a point of intersection or a point of departure in their research. The Muslim World, founded in 1911, is dedicated to the promotion and dissemination of scholarly research on Islam and Muslim societies and on historical and current aspects of Muslim-Christian relations. Oriens contains studies in the culture of Asia and North Africa from antiquity to the present, focusing on language, religion and art. "Studia Islamica is one of the oldest academic journals published in the field of Islamic studies. Published in Paris since 1953, it has been co-edited by A. L. Udovitch and Houari Touati since 2003. Focusing on the Islamic lands around the Mediterranean Sea and in south-west Asia, it publishes articles (in English and French) in the fields of history, religion, law, literature and language, for both the pre-modern and modern periods." The DTL coverage: 1953-2014 (No. 1 - Vol. 109, No. 2) with a 3 year moving wall. Practitioners and academics dealing with the Middle East can turn to the Yearbook of Islamic and Middle Eastern Law Online for an instant source of information on the developments over an entire year in the region. The Yearbook covers Islamic and non-Islamic legal subjects, including the laws themselves, of some twenty Arab and other Islamic countries. Islamic Studies LibGuide by Azeem Khan and revised by Christopher Crawford is licensed under a Creative Commons Attribution-NonCommercial-NoDerivatives 4.0 International License.